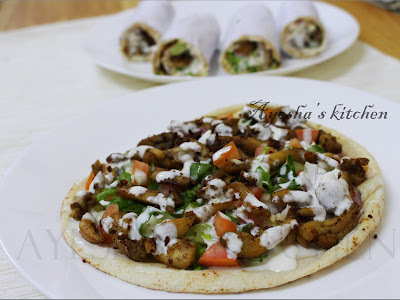 Hi foodies...here is your favorite chicken shawarma recipe. YAAH, the perfect super yummy recipe I must say. I have been trying to replicate the same recipe and flavor of shawarma which we get from Labanese restaurant for months at home. Have tried different recipes and have done with different spice combinations and cooking methods. Honestly saying, the cooking methods like grilling, tossing and baking is not the big issue. The choice of cooking is up to you only. All equally tastes great. But the spice combination, chicken marination, the white sauce or Tahini sauce used makes the real difference. The reason I love to make shawarma at home is that its very simple and ease in preparation when compared to sandwich, chappathi and curry or any other meals. For me, it's an easy and quick dinner meal recipe/ quick dinner idea. Shawarma / shawurma is a Levantine Arab meat preparation where lamb, chicken, turkey, beef, veal or mixed meat are placed on a spit and may be grilled for as long as a day. Shavings are cut off the block of meat for serving. 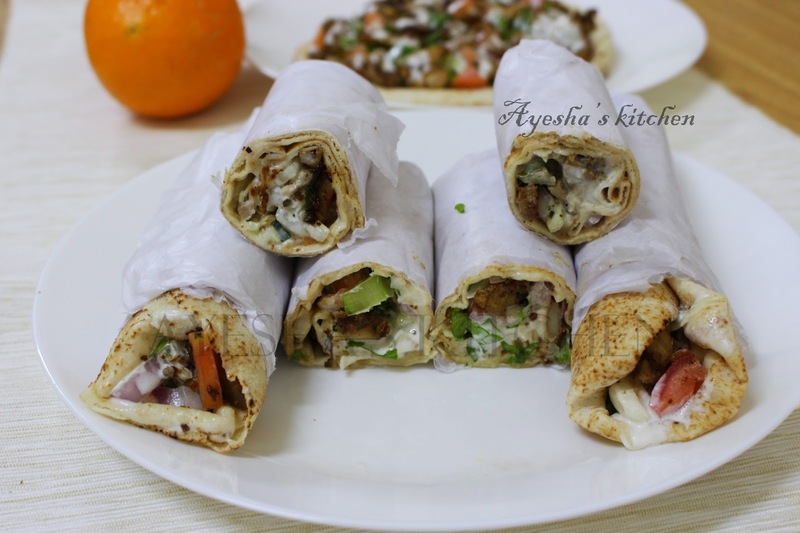 Shawarma can be served on a plate, or as a sandwich or wrap. It is usually eaten with tabbouleh, fattoush, taboon bread, tomato, and cucumber. It also includes the toppings like tahini (tahina), hummus, pickled turnips, amba and like so. The preparation of this middle eastern cuisine at home is quite simple but must be very careful in spice combo. Due to the unavailability of roasters at home, chicken shawarma remained as a restaurant dish. But we must change that attitude. 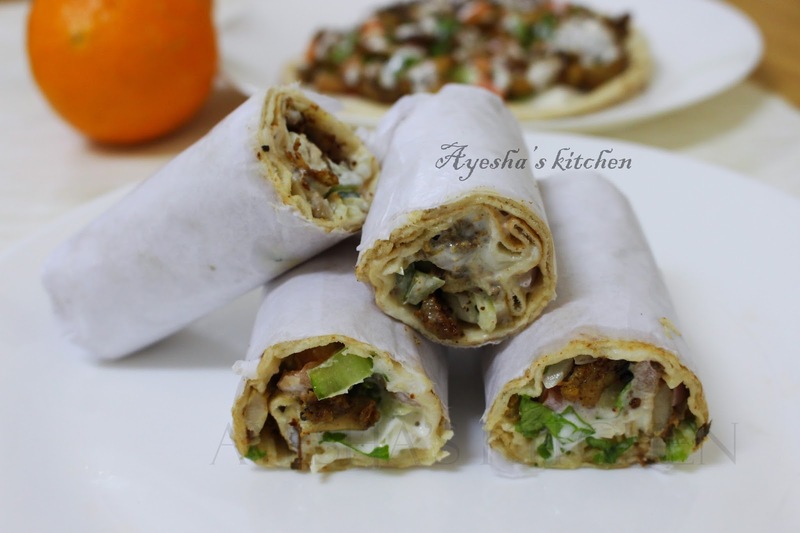 Try out this yummy perfect chicken shawarma recipe at home and be the star of your family. Am i Right? Of course, we all love to make such delicious food at home and wanna make our loved one's tummy yummy. Here is the recipe showing how to make the perfect homemade shawarma/shawarma on gas top/chicken shawarma without an oven. Do try and let me know how it turns out for you. Enjoy cooking. Next, we have to prepare the shawarma white sauce. For this, grind together all the ingredients listed under the preparation of sauce in a mixer to a fine paste. Keep it aside. Then heat a pan and add 2 tbsp olive oil and fry the chicken slices over a high flame and later reduce the flame and toss until done. Meanwhile mix together all the chopped vegetables in a bowl . (if anyone needs more creamy shawarma, then mix the vegetables with 1 tbsp white sauce ). Now we have to assemble the shawarma. For that, take a small kubboos / pita bread and apply some white sauce over it. Layer with chopped vegetables and then with fried chicken, french fries (optional) and again drizzle some sauce over it. Roll it in a butter paper tightly.